The Canadian Department of Fisheries and Oceans (DFO) is using the DLMtool to increase the efficiency, transparency, and robustness of its catch advice for British Columbia groundfish. Like many fishery management agencies, DFO currently lacks the capacity and informative data to produce timely stock assessment advice for all fish stocks targeted and encountered by its groundfish fishery. In collaboration with the DLMtool team, DFO is launching an initiative to integrate the DLMtool into its management system and to provide the necessary trainings to DFO scientists and analysts to sustain and evolve the program over time. The three-year project is focussed on developing a process for standardizing the application of the DLMtool to achieve the scale necessary to be applied to all unassessed stocks under management, including the resources that will be required to accomplish this, and an acceptable peer review process for resulting advice. 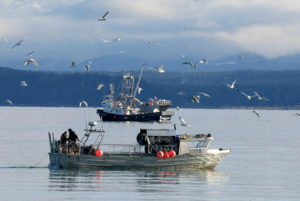 Expected benefits of the project include: the rapid evaluation of the performance of alternative data-limited methods for its unassessed stocks, the development of custom methods for generating catch advice for dozens of target and non-target groundfish species, the improved ability for stakeholders to meet eco-certification standards, and measureable progress towards ecosystem-based fishery management.